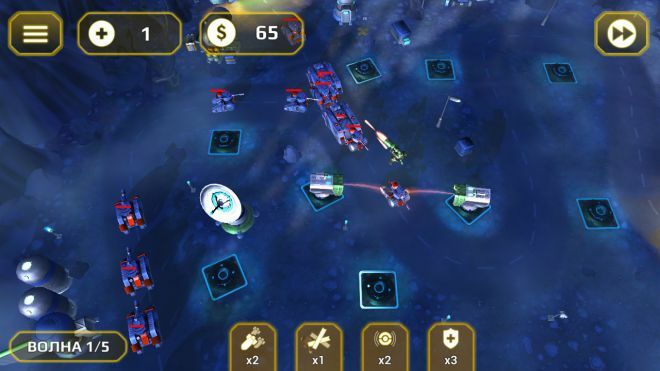 It is a pity that not all legendary strategies are ported from PC to Android. But on Google Play, there are a lot of applications that can more than replace them. And in today’s review, I tried to highlight the best games that belong to the genre of “Tower Defense”. The popularity of stickmen in the modern gaming industry is undeniable. Where they just can not be found – and shooting, and racing, as well as interactive games. But today is a special case – we are talking about strategies. Frankly speaking, it reminds me of the concept of Plants VS Zombies. And now I will explain why I think so. Let’s take a closer look: in Stickman Defense, there are several tracks that we will fill with units. The task is only one: to keep the waves of paper monsters. Yes, it is paper. It was not enough for us that these were just Stickmen, so also all units are literally made of paper. It is worth noting that in Stickman Defense the campaign consists of four chapters, each of which has 10 locations. There are no fundamental differences between the cards, they are simply decorated in different colors. Of course, the further, the more difficult it will be to pass the levels, and the number of enemies will increase. Yes, and their diversity will contribute, as in any way. If you are not sure that such a relatively short campaign will be able to interest you, then I advise you to try playing Stickman Defense in infinity mode. The battle will continue until the monsters overturn the defense and penetrate the treasury. To defeat enough 5 aspiring opponents. At first glance, it seems that Stickman Defense is an ordinary strategy, of which more than just enough on Google Play. But I think that it is worth attention, at least thanks to the internal game modes. For example, some cards are passed in the mode, when you can kill enemies only by tapes with your finger. The coolest mode is Extreme Mode, but spoiling would be ugly. What the players will definitely like are the defensive capabilities. The choice of the user provided 9 unique units, each of which has its own abilities and, accordingly, the application. Immediately I warn you: some units will need to be unlocked using game currency. And you can get it during the passage of the campaign, in infinity mode, as well as in roulette. Well, or just buy. Still, think the process is monotonous and boring? Monotonous models of protection in Stickman Defense, to put it mildly, do not roll. 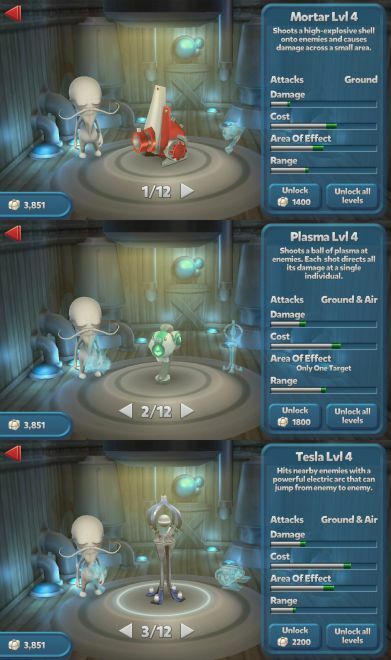 Each new level will bring something new, and the user will have to tirelessly pump units into the game menu, and raise them already during the battle in order to raise their attack and increase their health. No, these are not the Generals we know from the Command & Conquer universe. It’s all at times easier. Although to say that the game is of little interest, the language simply does not turn. And the whole thing here is that we have three generals at our disposal, and it is possible to pass each level in general on three levels of difficulty. 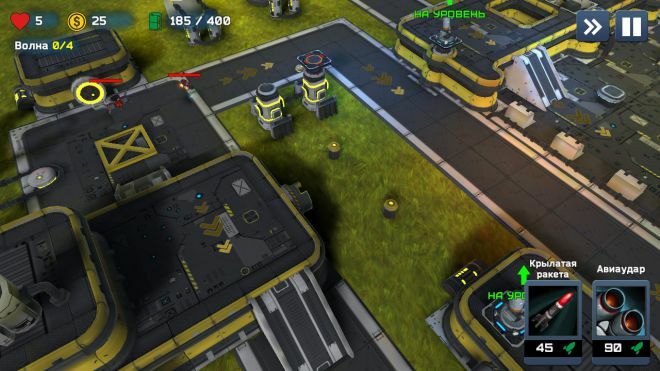 In Tower Defense Generals there is no multiplayer mode, only the campaign is present. It has more than 20 different missions. Considering that each of them can be completed in three difficulty modes, we get about 60 tasks in total. For the basic passage, 3 stars are awarded (if no unit is missed). The heavy and incredible mode will add another star. Since this is a conversation, what is the difference between them? In fact, the usual and severe difficulties are almost identical. The only difference is that in the second case we have no right to make mistakes. But in an incredible mode, we are awaited by a completely new, reinforced grouping of enemy troops. And none of the opponents should leave the battlefield alive. In Tower Defense Generals there are no special visual effects. Explosions are not fascinating entertainment, the voice bitrate is also not impressive. Rather, the average level. The same can be said about the detail of the objects. The only possibility that is at the user’s disposal is image scaling. Looking for a rich arsenal? Forced to disappoint: to fight with columns of enemy technology, you can use only four types of defensive structures. And the towers in their usual sense of the language turns to name only three: a machine gun, a laser, and a rocket launcher. The fourth type of protection is cars. In most cases, they are useless, because they conduct very weak shooting, and the main function is to delay the enemy. According to the developers, the player for the soul should catch the generals. These are unique units that take enemy fire and attack them themselves. After death, sometime later they are reborn. In function, they are similar to machines, but from the point of view of practicality, they are absolutely ahead of them. Each of the three generals has its own weapons and features. Previously, they were paid, but now to unlock you just need to collect trophies during the passage of single missions. Another recent innovation in Tower Defense Generals has become consumables that will help you complete tasks. So far, there are only four types: barriers (breaking the column), mines (undermining accidental transport), protection (increasing the number of opponents that can be missed) and an airstrike (causing a pointed attack at the specified area). 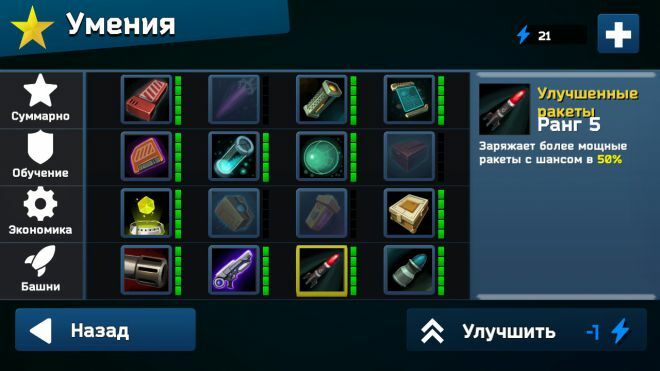 Each of the consumables can be purchased for 500 gears (issued for passing missions). This game is not far from its predecessor in terms of the diversity of towers. But in the graph, the differences are simply colossal. At least to begin with the fact that this game is three-dimensional, here you can change the angle of view and angle of inclination. Visual effects are much cooler. You get some kind of aesthetic pleasure when you watch enemy drones exploding. Yes, in Tower Defense Heroes we have to confront the robots. There is not the slightest hint of the presence of people. Fans of Borderlands 2 will see the familiar design of the buildings in the style of “Hyperion”. By the way, only robots made by engineers of the corporation also lived on these bases. What is it – the irony of fate or a non-random coincidence, implemented by developers? The meaning of the game is reduced to the already classical for Tower Defense scenario: troops are moving from input points A and B to the output points C and D. Our task is to prevent robots from reaching bunkers, otherwise, the mission will fail. And we will be helped in this by defenses, which, unfortunately, can only be placed in specially designated areas. Freedom of action in this regard, the user is not granted. But, on the other hand, it makes tasks more difficult and more interesting. 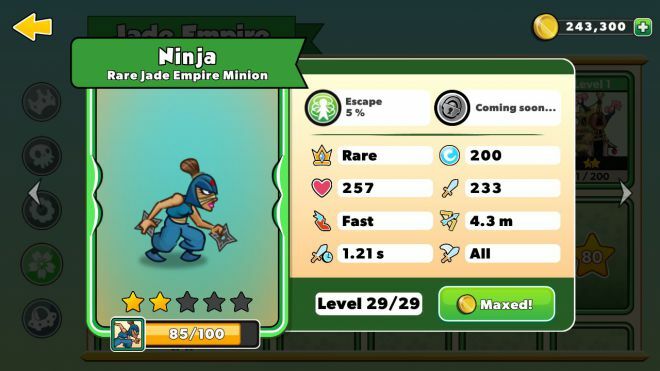 What is interesting is that in Tower Defense Heroes 2 there are ranks and a scale of experience. There is no network mode, and therefore the first logical question is: “What the hell, then do we need ranks?”. It turns out that the ranks depend on the possibility of pumping towers. But not only from them: for this, you will also need stars, which you can get for passing levels. Of course, in parallel, we will discover achievements, which will provide an opportunity to get nice bonuses. 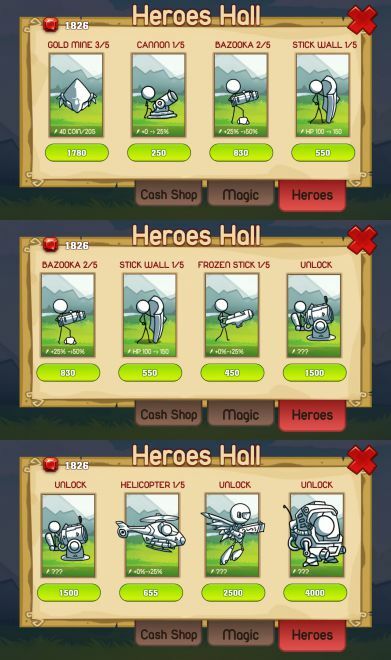 One would expect that with the help of the same type of tactics in Tower Defense Heroes 2, all missions cannot be completed. And indeed it is. The most powerful weapon can rightly be called a rocket launcher. It fires on both ground and air units. And if in Tower Defense Generals it is a more effective means of defense than a machine gun, then here it is not. To fight with air robots in this game, the machine-gun nest is simply irreplaceable. And if so, then it is necessary to balance between armaments in order to timely suppress all types of troops. Another advantage of the game is the player’s skills. They have a passive value, but very well help with the passage of the campaign. Who will refuse to earn additional experience or money? Especially when it comes to the application, for example, airstrike. Player skills can reduce its cost, as well as reduce the time cooldown. The same story with cruise missiles. In general, the possibilities for pumping there. A very unusual game from the genre of “Tower Defense”. Let’s understand: in one game we had robots, in the other so all real troops. We defended the landfills, defended the bases, did not even allow them to break through to the treasury … But we will protect the sheep for the first time. And from whom? From aliens! Tower Madness 2 can be from the heart to fall in love with the fact that in most cases the user himself paves the route for his opponents. The fact is that the towers can be installed in various places. And this is one of the strategic possibilities of the game. The trick boils down to the fact that the user can leave only one of the three paths of an offensive. One cannot but agree that it is much more convenient to defend one passage than three at once. However, this principle applies only to ground forces. But the air units will move to the base of the path that was originally prescribed to them. You know, the aliens are not accustomed to standing on ceremony with people. But do not worry: anti-aircraft guns quickly deal with troublemakers. There is nothing more effective than anti-aircraft guns against air units. In Tower Madness 2 there is where to turn your strategic thinking. It was not at all accidental: some opponents are equally susceptible to all types of weapons, but some almost completely ignore the damage of some towers but receive powerful critical damage from others. All this is told as it progresses, but, unfortunately, in English. This is one of the main drawbacks of the game. Already at this stage, there is interest in Tower Madness 2 . It so happened that strategies attract people with their complexity. But that’s not all: the game has bosses that appear through a certain number of waves of ordinary units. They, in fact, have the same appearance and are vulnerable to the same weapon. However, the health of the bosses is not an example anymore, so the forces for their destruction need to spend a lot. In order to successfully advance in the single-player campaign, it will be necessary to pay attention to the pumping of weapons. It comes down to raising the maximum level of a particular tower. Modernization is carried out already during the battle. And for this, you need to use gold that falls out of defeated aliens. That’s the whole point: the user must balance between installing new towers and pumping out old ones. At the same time, it is necessary to monitor which opponents will land on the nearest waves. Tower Defense – is not only the destruction of opponents who are trying to get on a given route. It is also epic wall-to-wall battles. However, the main task will be the defense of the main tower (and its varieties represented as many as 8 pieces) from enemy units. I do not hide my sympathy for the game, because Tower Conquest has become one of the best creations that I have just met in the Android gaming industry. 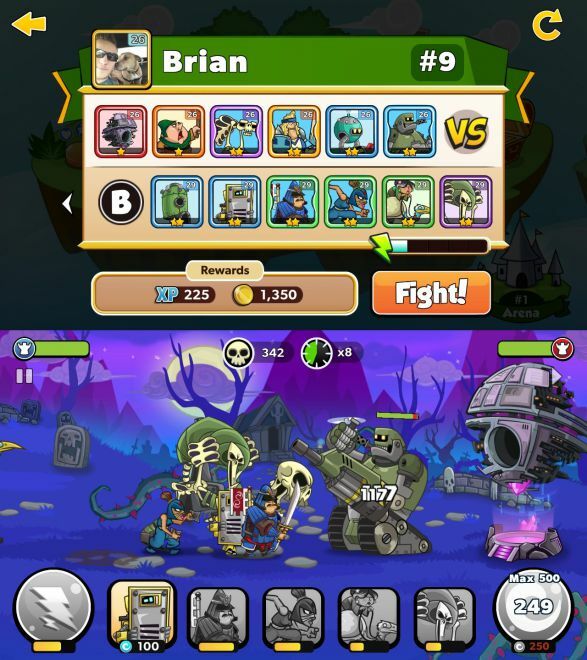 The battles are two-dimensional, and usually, they are not impressive to users with special entertainment. But this is an exception to the rule. Drawing done in cartoon style. It feels like watching interactive comics. But how everything is beautiful here! The voice acting is not the best, but the four on a five-point scale works out just to cheer. There is no image scaling, but it is not needed here. But the effects of active attacks and passive skills are very appropriate. 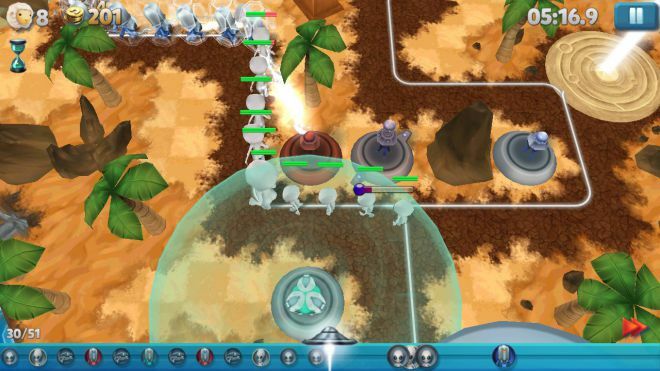 In Tower Conquest, there are two game modes: the single-player campaign and the network arena. In the single-player game, we will travel from world to world, and their number is unlimited. That is, even when reaching the maximum level (and this is still a figure of 100), the player can continue to pass single missions. Another point is that AI teams will have not only the maximum level but also a high evolution of heroes. Evolution in Tower Conquest is responsible for improving the characteristics of characters. You can evolve a hero four times, and for each time you need to collect more and more of his cards. This process allows you to increase the attack and protection of the character, as well as increase the chance of triggering a passive skill. In addition, each time, the appearance of the unit changes little by little. Thus, the evolution of heroes in Tower Conquest becomes simply an indispensable and desirable process for all players. The most interesting thing is that passive skills are unique for each of the 70 units. 8 of them are towers, 8 more are bosses. The remaining characters are divided into several classes. 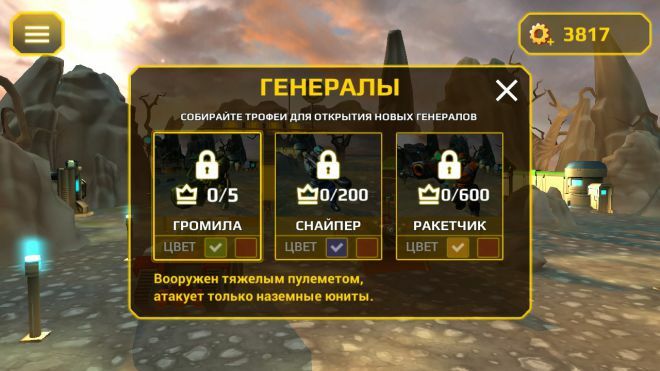 For example, tanks (high health), attack aircraft (medium health, but medium attack), criteria (high damage, but low health), healers (do not attack enemies, but heal their own), Rangers (attack from a distance, often any goals). In Tower Conquest, you can collect 5 unique teams. Each of them must have one tower and one boss. The remaining 4 places are occupied by ordinary units. And now just imagine how many combinations you can make from these cards! Some players even collect 5 squads, each of which consists of units of only one faction (kingdom, evil, robots, the jade empire, and the newcomers). 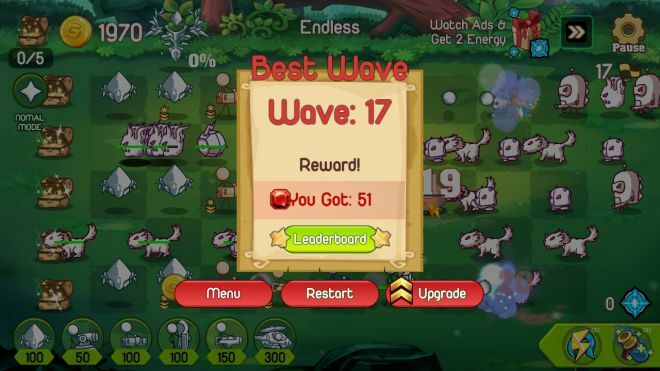 Given the nice bonuses for users who tie a game account to Facebook, daily tasks, epic battles in the arena with other players and other amenities of the game, I can say that most fans of the strategies of the Tower Defense genre will appreciate this game.